We are happy to announce the availability of TestRail 2.3, a new version of our web-based test management software TestRail. With more than 60+ changes, improvements and bug fixes, this is the biggest update of TestRail since we released version 2.0 last summer. The new version comes with major scalability and performance improvements, new alternative views for test suites, runs and plans, and introduces an updated Todo page that makes it easier to track assigned tests for different test runs, besides many other changes. Please see below for a detailed description of the new features and other improvements. 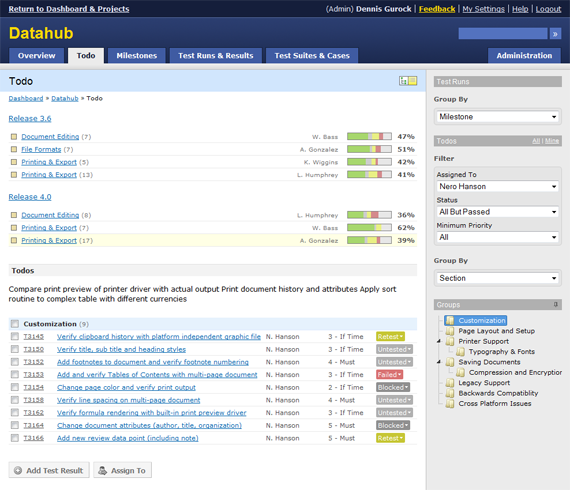 TestRail’s test suite and test run pages were always one of the strong points of the application: users can easily add new test cases, group test cases in sections and rearrange items via drag&drop, all without having to leave the main page. With larger test suites, however, having hundreds of test cases and sections on a single page can make test suites difficult to manage. That’s why we are very happy to introduce a new, alternative view for test suites, runs and to-dos that allows you to view just a single section. The new view works like Windows Explorer and similar interfaces and provides a tree of the sections in the sidebar to select and view the associated test cases. 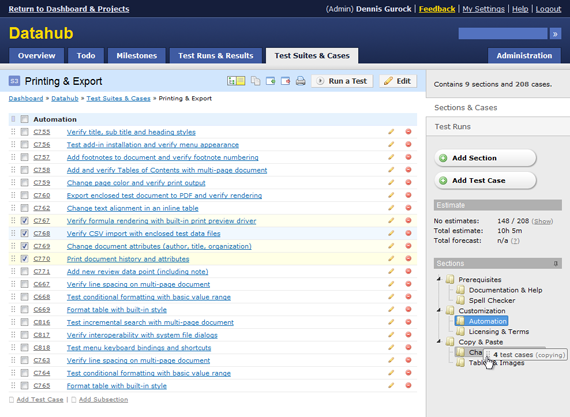 The new section tree is also available on the test suite, run and todo pages regardless of the view mode. The new tree makes it a lot easier to rearrange and work with sections, as you can directly drag&drop sections in the tree. The new tree also makes it easier to rearrange your test cases. While it’s still possible to drag&drop test cases within a section, moving test cases to another section can now also be accomplished by dragging one or multiple test cases to a section in the sidebar tree. 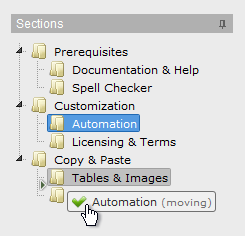 You can also copy and duplicate test sections by pressing the Shift key during the drag&drop operation. The same is true when you drag&drop test cases within a section or when you drag test cases to another section. TestRail has always been a fast and lightweight application, but one of the major goals for this release was to make TestRail faster for larger installations and for larger teams. So we looked at every TestRail operation, every database query and the details of all database models to fine-tune and optimize every aspect of TestRail. The result of this effort includes more than 50+ performance improvements, database model optimizations and algorithm changes and we are very happy about the outcome. Many other user interface changes and new features in this release also make it easier to work and manage more data with TestRail. Especially larger test suites, test plans and projects in general now scale better with larger amounts of data. For example, test plans have a new view that lists test runs in a more compact way. Other enhancements include the option to mark projects as completed and to display user names in different ways (which is useful for larger teams when many users have the same first name). The new TestRail release also introduces an updated Todo page. The new Todo page now shows a list of test runs that have tests assigned to the currently selected user. You can then select a test run to show the assignments for this particular run. 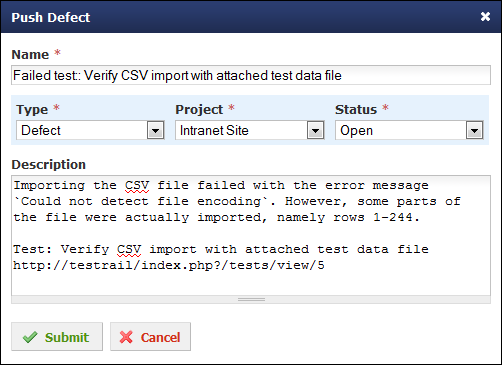 The new interface makes it a lot easier to work with assigned tests if you work on different test runs in parallel. 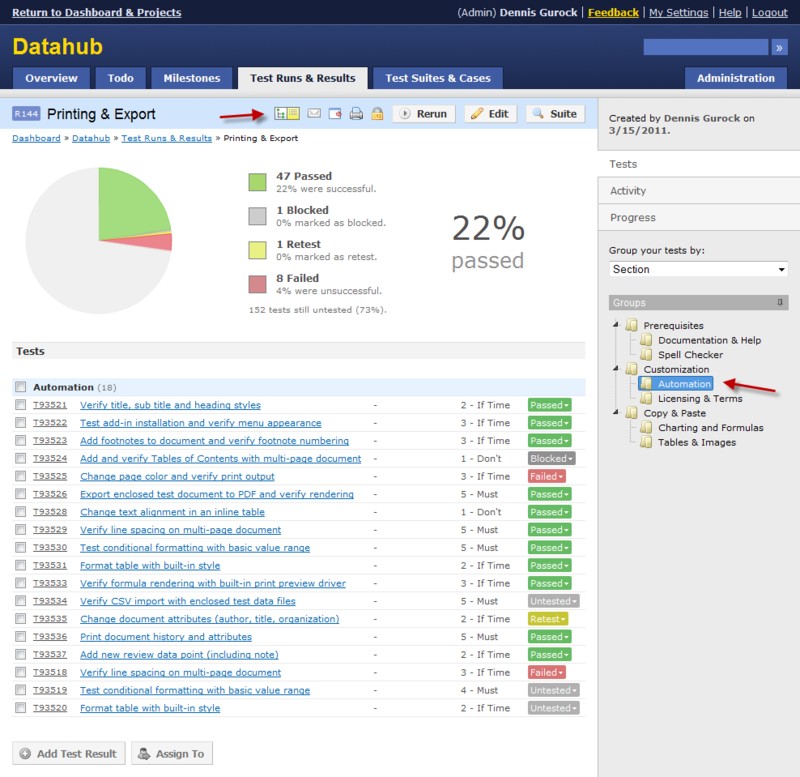 The updated Todo page also provides the option to group test runs by milestone, test plan or date and also shows useful context information such as the description of the selected test run or test plan. 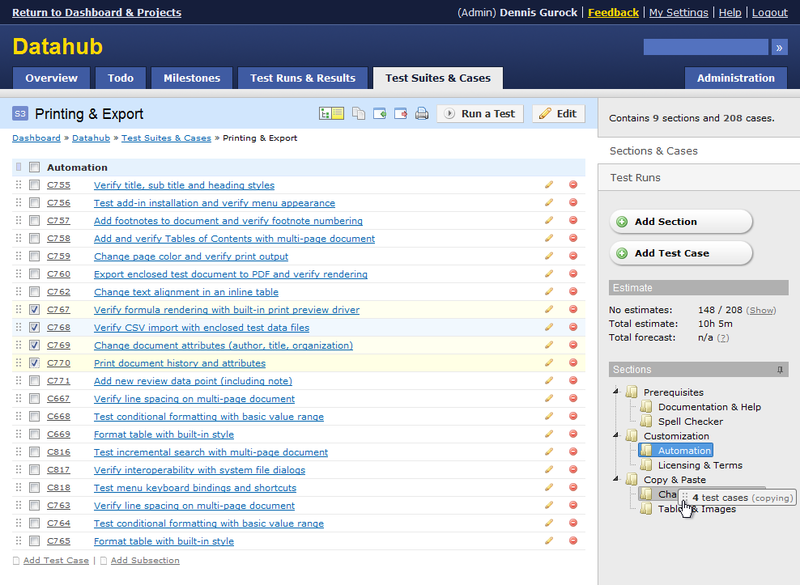 The Todo page has also been updated with the new compact view and section tree in the sidebar. TestRail 2.3 also comes with improved support for third-party tools. Microsoft released Internet Explorer 9.0 earlier this week and the new TestRail version fully supports the new web browser release. We also added improved support for Axosoft OnTime. We now ship a defect plugin with TestRail that allows you to push defects to and look up bug reports stored in OnTime. The defect plugin only requires that you have the OnTime SDK installed for your OnTime system. 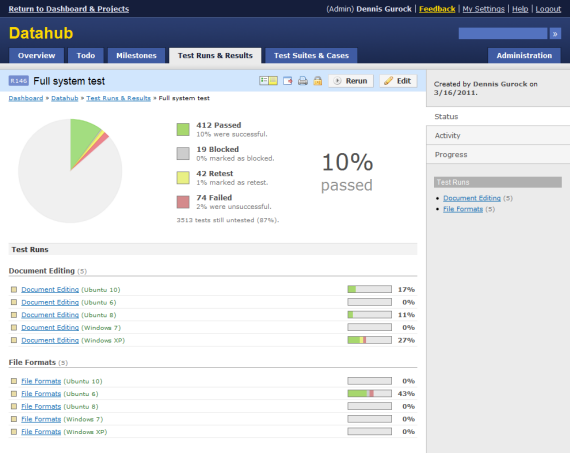 You can learn more about the OnTime test management integration on our website. It’s now also possible to access all test case details from defect plugin scripts, allowing for more flexible customizations of the plugins and integration. TestRail also comes with various other enhancements and bug fixes. For example, we have redesigned several parts of the user interface to make it cleaner and more consistent across the application. The Excel export file format has been updated to include the date and time of the last test results. We now also use the configured installation name for the email subjects and from names so it’s easier to customize the generated emails. And to make it easier to backup uploaded attachments, a new admin option has been added to the config.php file to specify the file permissions of uploaded files. To view the complete list of changes for TestRail 2.3, please see the change log. Please note: If you are using the extended TestRail API, please email us to receive an updated version of the API as it has changed for TestRail 2.3. Existing customers can download the new version from our customer portal. New users can download our QA management software or create a hosted trial on our website. If you want to update your existing TestRail trial (download or hosted), please contact us and we will provide you with the necessary details. Please refer to TestRail’s Admin Manual on how to upgrade an existing installation. If you have any questions about the new version, please let us know.